Track experience #5 – The best yet! Aston Martin unveiled the DB11 at the Geneva International Motor Show. It was around lunch time and I was – quite illegally – watching it unfold at work on my mobile. For a very long time indeed the DB4 had been my favourite Aston Martin; my favourite car even, but now? I haven’t forgotten the DB4, but the DB11 stole my heart. My best friend and I went to Geneva to see the new Aston for ourselves. We ended up spending about 45 minutes at the stand across several visits that day. We marvelled at the engine which was on display (it’s big! ), the car’s cut out model, showing the technology in the bodywork, and of course the DB11s on display. 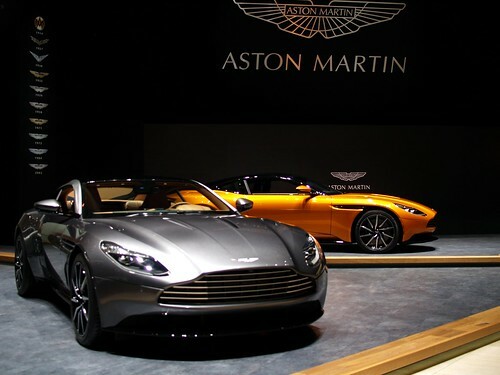 The DB11 on the Aston Martin Lagonda Ltd. stand at the Geneva International Motor Show in 2016. It’s almost 2 years after the car was unveiled in Geneva and I’ve seen my fair share of DB11s – on the road, but also at the factory in Gaydon. On this day, though, it is time to drive it! My best friend and I drove 4 laps (approximately 6 miles) each in the car. This is the V12 version, so not the recently released V8 car. Of course there is nothing wrong with a V8, but I was very curious about the 5.2 litre V12 that AML built for the DB11. Apparently it can go from 0 to 60 in 3.9 seconds. I think that makes it the fastest car I’ve driven so far. I already knew that when you’re inside the car it doesn’t feel very large at all, even though it is by no means a small car. Being an Aston Martin it’s obviously also not a particularly light car, despite the fact that the DB11 was created as light as possible. When you drive it however it feels like it weighs nothing. The moment you take your foot off the brake it starts rolling quite gently, but when you put your foot down it runs off with you. What a drive! The Aston Martin DB11 at Prestwold. The Prestwold track is approximately 1.3 miles long, so the straight is not very long. Just before the straight there is a safe zone where you are allowed to go only between 40 and 50 mph. Thankfully the DB11 speeds up quite quickly, but the straight is not long enough to make it to 100 mph before the braking point – almost though. Since I know the track quite well now I am certainly improving which allows me to enjoy the drive more. The shift paddles are not a novelty for me, so that is no longer a distraction either. The DB9 I drove a while ago is of course a few years older than the DB11, but since they are both Aston Martins I feel it’s fairly safe to compare them. Like the DB9, the DB11 doesn’t dive down when you brake hard. Braking is very level and comfortable. The DB11 did feel a lot faster, but also lighter than the DB9. If the interior didn’t very clearly look like Aston Martin you could be mistaken and feel it’s a much smaller car. Only when I had to park it did I realise this car has a very long nose. But even at slow speeds it handles really well and as light as a feather. Overall the handling is very smooth, so you have to waste no brain capacity on driving. It is simply natural. It makes the drive the best I’ve had so far and I got out of the car with pain in my heart. I’m guessing I will repeat this track experience. It was just too good not to. This entry was posted in Track experiences and tagged "Aston Martin DB11", "Aston Martin", "track day", "track experience", DB11, driving. Bookmark the permalink.